Building on the momentum of intentional inclusion from our inaugural event, NOMCON 2019 celebrates the Power of the Network; that our collective talents, resources and backgrounds are the backbone of the Maker Movement and by working together, we are stronger. 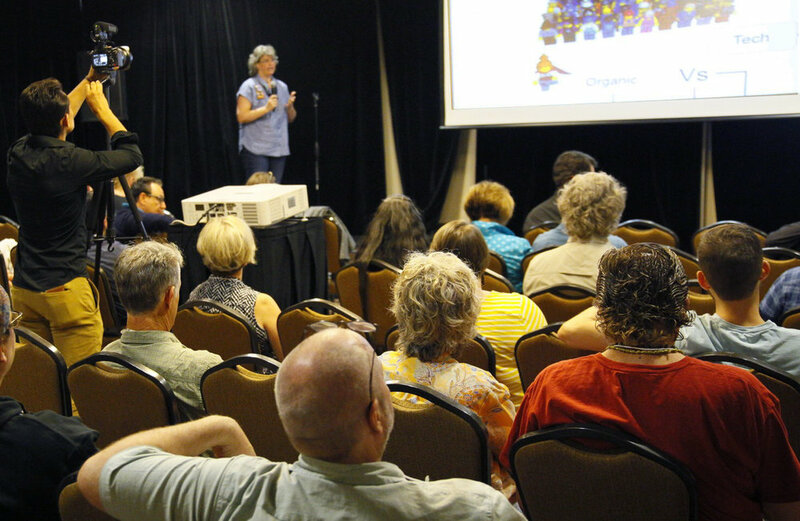 We accomplish this by curating an engaging conference that encourages attendees from all corners of the country to harness the power of the network together through facilitated breakout sessions, small-team working groups, open discussions, structured and unstructured networking opportunities, and dynamic keynote speakers. We invite your organization’s partnership as we work together for the benefit of: strengthening our inclusive network of maker organizations, engaging our diverse maker network in deep and meaningful collaborative exchange, celebrating our continued success with current partners, and expanding the Maker network by welcoming new partnerships with extraordinary industries and organizations. 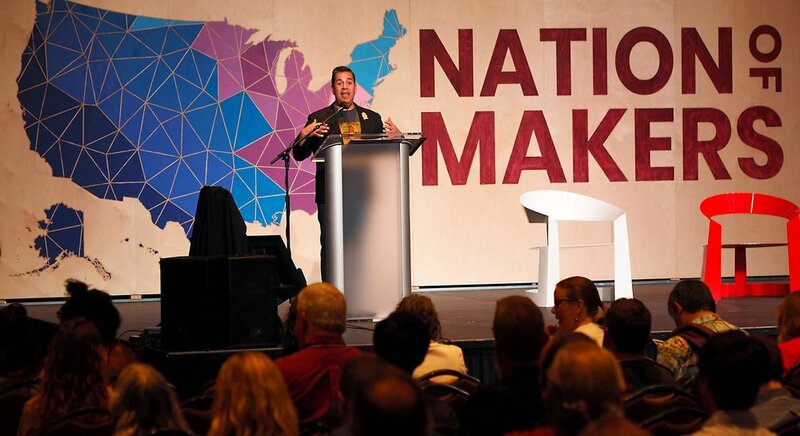 Together, we are capable of producing tangible projects and partnerships that utilize the Nation of Makers network to have far reaching impacts throughout the United States and beyond. Please see below for a variety of ways that you can partner with us to support NOMCON 2019, and to strengthen the Nation of Makers network. We look forward to your support. Top level impact and recognition. Premium logo placement on print materials. keynote speaker during opening and/or closing plenary sessions. Prime selection of your Quad booth in the Exhibitors Hall. First pick for Conference Speaker Track Session. First pick of named sponsor hosting official Friday or Saturday networking receptions. Logo placement on printed program and materials. Second pick for Conference Speaker Track Session. Prime selection of your Double booth in the Exhibitors Hall. Second pick for named break-out room or other gathering space. Group recognition during opening and/or closing plenary. Prime selection of your Single booth in the Exhibitors Hall. Third pick for named break-out room or other gathering space. The track partner will assist in supporting the track session in the lead up to the conference by helping to articulate the relevance of the track session to the broader community and recruit talk submission (which will be reviewed and selected by independent curators). At NOMCON, Track Partners will open each Ignite Talk session and introduce the speakers as well as welcome attendees to the working session. Additionally, partners will receive branding and recognition in printed/online program, conference notifications and announcements, and on-site in the breakout room locations. Following the conference, the Track Partners will be recognized during the ongoing work facilitated by the seed-fund as well as during a Community Conference Call dedicated to sharing outcomes from the working groups. In addition to the overall conference experience, there is a specific need for providing food and refreshments throughout the two day experience. Without support, however, we will not be able to cover these expenses. We would like to have breakfast at the Chattanooga Convention Center each morning of the conference to welcome attendees and encourage early arrival. Throughout the day, we would also like to have break stations with quick snacks and drinks (water, coffee, and/or juice) to provide important energy boost and mingling opportunities for attendees. Branding and recognition for each day’s breaks partner will be included in printed/online program, conference notifications and announcements, and on-site at food location. Two official evening receptions, one Friday and one Saturday, will welcome attendees and provide more opportunities to build on the power of the Network (each with a different theme or focus). These events are key social networking mixers and will have high visibility in planning and program. Each of the receptions will be hosted by a top-tier sponsor, and co-hosted by a reception partner. Branding and recognition in printed/online program, conference notifications and announcements, and on-site at food location. We are mapping out a series of “bus routes” for which we will charter a 55-passenger commercial bus to drive with pre-planned stops at hacker and maker spaces along the way. Passengers will be expected to pay a portion of the cost with a set portion of the seats will be reserved for those who otherwise would not be able to afford to attend the conference. Each bus will be labeled for the sponsoring organization and will be used during the weekend for help shuttling attendees between the convention center and the hotels or locations for receptions, etc. Additionally, branding and recognition in printed/online program, conference notifications and announcements, will be made to recognize the travel partners.